Mining is a dangerous, unpleasant job. The atmosphere underground is hot, humid and hypoxic (which means there’s not a lot of oxygen down there). Humans have been going down mines for centuries, but it has always been risky. Working conditions are bad and disasters like tunnel collapse or explosions are real dangers. What’s more, as surface level minerals are used up, mines continue to get deeper and deeper with the deepest mines going over 4km underground (that’s the same distance as the height of 10 Empire State Buildings!). The Mining-ROX project is a research project headed by the Technische Universität Bergakademie Freiberg, Europe’s only university with a research and teaching mine. The research team are looking at ways to apply autonomous robotics to mining, to remove dangerous tasks from human workers and also aid in rescue scenarios. The project is part of the larger research initiative called Robots in Saxony (ROX), a collaboration between German universities to apply autonomous service robots to unstructured environments. Their partner project T-ROX (Teaching Robots in Saxony) at Dresden University was a finalist for the KUKA Innovation Award at Hannover Messe this year, presenting as Team WEIR. 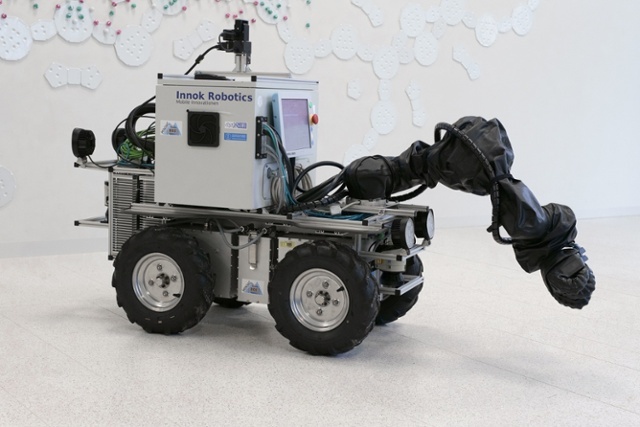 Mining-ROX currently has two robotic research platforms: Alexander (great name!) and Julius. Both are named after famous German scientists. Alexander is a four wheel drive electric mobile platform running ROS Indigo. The platform is based on a Clearpath robotics Husky. It has two laser scanners, a lighting system, ethernet cameras and also RGB-D cameras. Julius is also a four wheel drive electric platform, this time based on an Innok Robotics vehicle. It also runs ROS Indigo and has fewer sensors than Alexander. It has a UR5 manipulator with our Robotiq 3-Fingered Gripper. There is also a third robot, Elisabeth, which is currently under development. We spoke to Prof. Bernhard Jung to learn more about the project. Robotiq: Why do you think that autonomous robots, like Julius, are important to the future of mining? Robotiq: What mining scenarios are you investigating with Julius? Bernhard: One role of Julius is to act as an assistant during mine surveying tasks. The robot accompanies a human surveyor, carrying the heavy equipment and collecting sensory data. It can hold and operate handheld measurement devices, whose weight can easily become cumbersome when manually operating them for several hours in the strenuous mining environment. Another scenario is the exploration of mine areas that are unsafe for humans, for example in disaster cases, abandoned mines or the fully man-less mine of the future. Robotiq: You currently have two research robots. How are the research goals different for each of them? Bernhard: With Julius, we are exploring the opportunities for mobile manipulators in underground mining. This includes collecting sensory data, which are automatically geo-referenced thanks to the robot’s visual localization capabilities. It operates handheld devices that have been designed for use by humans. In the exploration scenario, Julius is typically tele-operated. 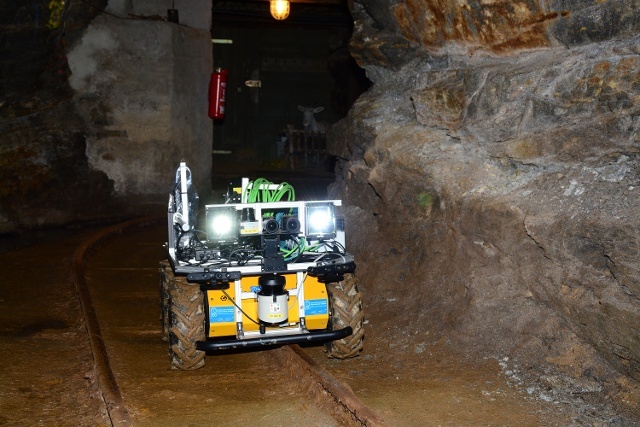 The robot has to establish a data communication link to the base station, which it does by placing WLAN relay stations throughout the mine. 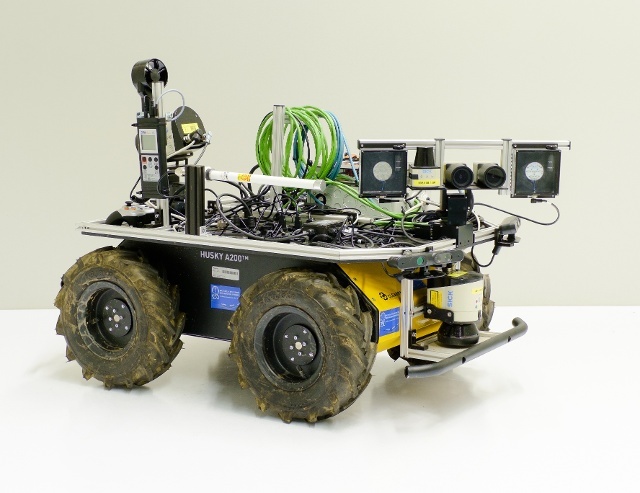 Alexander is another mobile robot that we use for 3D mapping of mines. It features several cameras and Lidar sensors but does not need a manipulator. By the way, Alexander is named after Alexander Von Humboldt, an alumnus of our university who investigated the vegetation of the Freiberg underground mines when he was a student here. Robotiq: Who is the Julius robot named after? Bernhard: It is named after Julius Weisbach, who was a famous German Mathematician and Engineer. He was a professor at the Bergakademie Freiberg in the middle of the 19th century. Today he is maybe best known for his contributions to fluid dynamics including the so-called Darcy-Weisbach equation for modeling pressure loss of fluids in pipe systems due to friction. Weisbach made significant contributions to the theory and practice of mine surveying. He pioneered the application of the theodolite for mine surveying, a precursor to the total stations commonly used for the task today. Weisbach represents the advancement of the state of art in mining through new technology, and this is what we strive to achieve with our mining robots. Robotiq: What made you choose the Robotiq 3-Finger Gripper for Julius’s Manipulator? Bernhard: We were looking for a versatile Gripper that is capable of grasping very differently shaped objects. Given our requirements, the choices of commercially available options are actually limited. The robot should be able to operate handheld scanning devices made for human operation, such as a XRF-scanner for on-site material analysis. Only a hand-like gripper can firmly operate these devices, so the 3-Finger Gripper design was a natural choice. 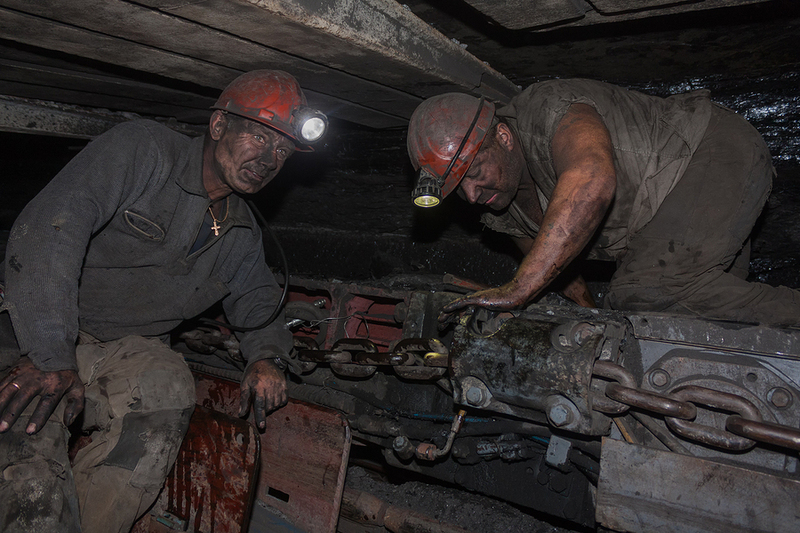 Also, in our underground mining environment, a further requirement is the protection against acidic water drops. Luckily, Robotiq offers a protective glove for that purpose as an accessory. Robotiq: You are using ROS Indigo to control Julius. Did ROS compatibility influence your choice of Gripper? ROS integration is absolutely essential. 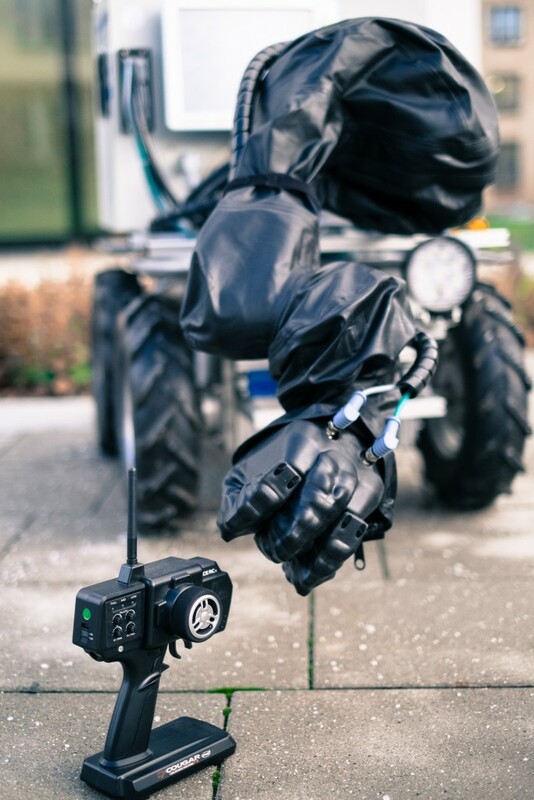 All of our control software are based on ROS: the mobile robotic platform, the UR5 arm and the Gripper. Without ROS support we would not have opted for the Robotiq Gripper. Robotiq: How is the collaborative nature of the UR5 important for a mining robot? Bernhard: The light-weight design of the UR5 is clearly desirable considering the limited payload and energy supply of the mobile robotic platform. However, even more critical in mining environments are the safety aspects. The fact that the UR5’s safety system has been certified by the TÜV (the German Technical Inspection Association) was key in our decision to use it with the Julius robot. Robotiq: What’s next for the Mining-ROX project and the Julius robot? Bernhard: There are plenty of things on our todo-list. For Julius, a next goal is to have the robot set up a wireless communication network in an abandoned mine. 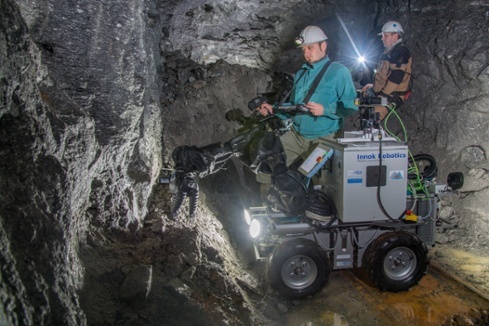 Another goal of the Mining-ROX project is to investigate creative use-cases of the 3D mine models which have been scanned by the mobile robots. For example, in customized Virtual Reality training simulators for miners and rescue teams.